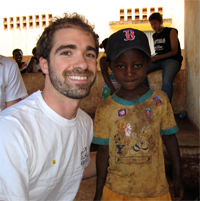 Dr. Mirandola with one of his favorite patients in Madagascar, 2008. How Can a Young Infant or Child's Spine be Injured? At the final stages of fetal development or shortly after entering the world, it is common that the health of the infant's spine may be compromised. How? While still in the womb, the infant's spine can be compressed or contorted in a way that can cause vertebrae to be pushed out of position when the mother's pelvis is not properly aligned. Similarly, the birth process itself is known to be a major factor in spinal injury to the newborn. Harvard medical researcher, Dr. Abraham Towbin, proved as far back as 1969 that the process of a "normal hospital delivery" could cause direct injury to an infant's spinal cord and brain stem. (Developmental Medicine and Child Neurology 1969, Dr. Abraham Towbin.) This research has been proven valid in many studies since this time. Additionally, spinal injury in children can occur as a result of frequent falls, bouncing, or jarring of an unsupported head or neck in the first few months or years of life. These include: while learning to walk, falling out of bed, sudden stops in an automobile, repetitive bouncing on the knee, hits to their head. Many of these seemingly innocent and everyday occurrences can cause spinal subluxations (nerve interference). How Can Parents Recognize Spinal Problems in their Child? How are Children's Spinal Problems Corrected? Dr. Mirandola will perform a careful and thorough spinal examination on your child's spine to look for nerve interference and correct the spinal misalignment with a gentle and specific adjustment. In most cases, an adjustment is performed with no more than a slight pressure administered to specific vertebrae in the appropriate direction. At Allasso Chiropractic we know that your children and their health are among your greatest and most precious possessions. Knowing this, Dr. Mirandola assures as much time as needed to answer all of your questions so you are comfortable and confident in our ability to allow your child to express their true health potential.